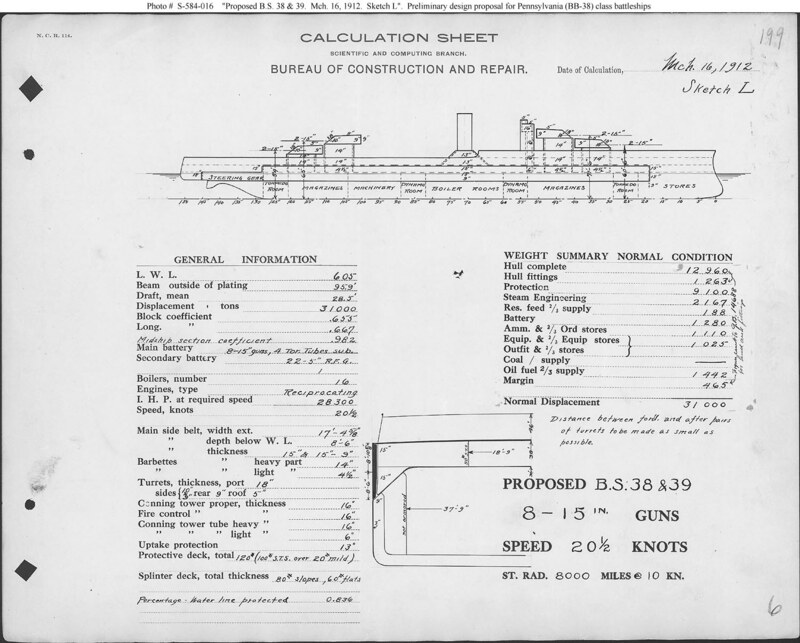 Preliminary design plan for Fiscal Year 1913 battleships. This plan is similar to that of the preceding Scheme "K" (see Photo # S-584-013) but instead mounted a main battery in twin rather than triple turrets, reflecting concern that the new triple turret might prove unsatisfactory. This plan apparently was never sent to the General Board but rather reflected interest within the Bureau of Construction & Repair about the implications of twin turret designs. Selection of a 15-inch gun, a caliber not in development for the U.S. Navy, illustrated a hypothetical larger caliber for a ship having fewer main battery guns. 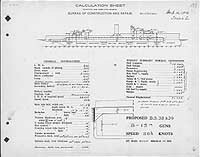 This plan provides eight 15-inch guns, reciprocating steam machinery, and a speed of 20.5 knots in a ship 605 feet long on the load water line (L.W.L. ), 95.9 feet in beam, with a normal displacement of 31,000 tons.